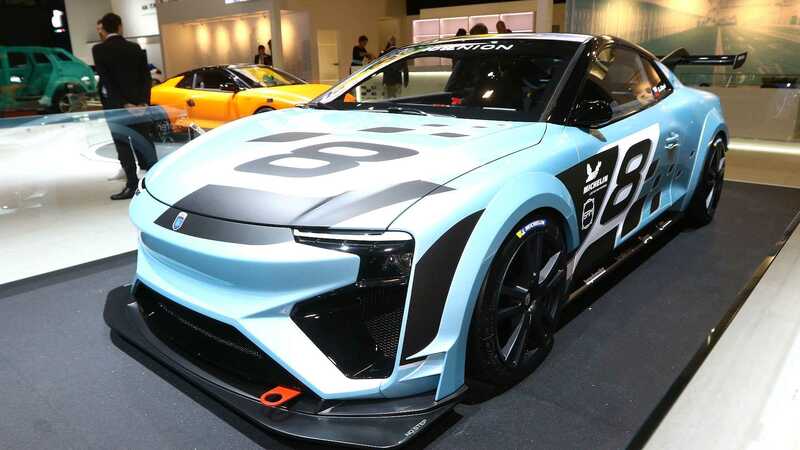 At the ongoing 2019 Geneva Motor Show, German engineer and businessman Roland Gumpert unveiled the track-going Race version of his methanol/electric super sports car Nathalie introduced last year. The official description of the street-legal Nathalie states that it has four electric motors jointly producing between 300 and 600 kilowatts. According to Auto Motor und Sport, the drivetrain actually has a fixed power rating of 408 kW (555 horsepower). In turn, the Geneva racecar peaks out at exactly 600 kW (816 hp), which enables it to sprint to 100 km/h (62 mph) in less than two seconds and only hit the artificial speed ceiling at 300 km/h (186 mph). There is something to be said about the powertrain of the Gumpert Nathalie Race. Even though the car is purely electric by design, it draws its power from a small buffer battery continually charged by methanol fuel cells. Once full, the methanol tank enables both the road-going Nathalie and the Nathalie Race to cover impressive distances: 850+ km (530+ miles) if you keep going at 80 km/h (50 mph), or around 1,200 km (750 miles) if your average speed is slower. The racecar features performance brakes, improved engine cooling, tweaked suspension, and an aerodynamic kit. Its interior is predictably minimalistic and only contains the bare necessities. A new road-going Gumpert Nathalie currently costs between €300,000 and €500,000. You can’t go wrong assuming that the Race version is even more expensive than that.